You will need Xcode 10 and Vapor 3.0. Some understanding of Vapor will be helpful. In this tutorial we will be creating a new iOS chat app using Chatkit with a Vapor backend that handles creation of our users. At the time of writing there is no official Chatkit server SDK so we will be interacting directly with the Pusher Chatkit API. This will create a new Vapor project, build the project and open it within Xcode. Once Xcode opens remember to set the run scheme correctly. Open your Package.swift file and replace the contents with the following. // A server-side Swift web framework. // Swift ORM (queries, models, relations, etc) built on SQLite 3. Here we are creating our user type. We are saying that the ID field for the database is a UUID that we will provide. We will be able to use this UUID to create our user on the Pusher platform as well. We have also provided a constraint on the name field and said that this must be unique. If we try to create a new row in the database with a name that already exists it will fail. 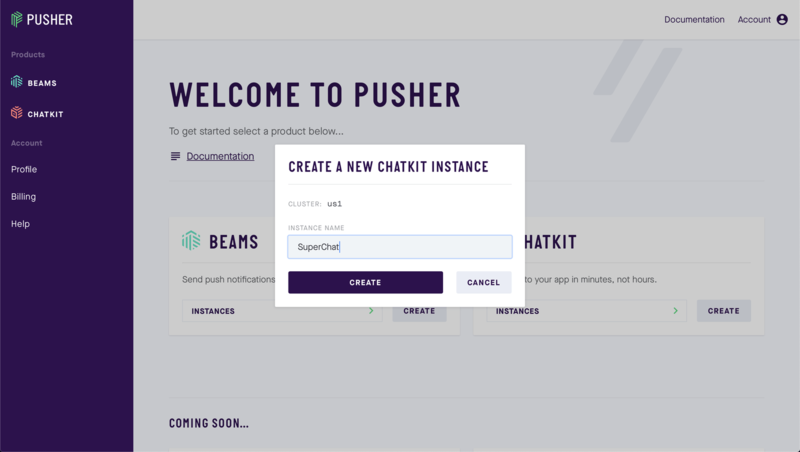 Open your Pusher dashboard or create a free account by following this link, create a new Chatkit instance and name it SuperChat. /// Controls basic CRUD operations on `Todo`s. This controller has two methods. Our find method takes a name property and performs a search on the Users in the database. If it finds a user with the matching name it returns it in the response, if it doesn’t it sends a 404 status code. The our second method create also take a name property as a parameter and creates a new user. We start by creating our Chatkit end point, you will need to add your instance ID here. We then create a new UUID for our user and then attempt to create and save this user. We can only create the user if the name is unique. If we successfully save the user to our database we then create a JWT token and use this as our authorisation token before we post the details of our user to the Chatkit endpoint to create our user. let secret = "YOUR_CHATKIT_SECRET KEY"
Replace the placeholders with your instance ID, API key and secret key that we made a note of earlier. This function will use the package we installed in order to create a token that we can add as BearerAuthorization in our requests with the API. The token will last for 15 minutes from creation and importantly the su key gives admin access. Finally we need to create our routes. Open your routes file and replace the contents with the following. Here we are creating two routes one for creating our new users and one for logging them in. Note we won’t be handling password authentication but just logging users in if we find the username in the database. In this part of the tutorial we’ve learnt how to create our Vapor server, create and save a unique user to the database and also interact with the Pusher API directly. In the second part of this tutorial we will create the iOS application that interacts with this server and the Pusher Chatkit SDK. The source code for part one can be found here.